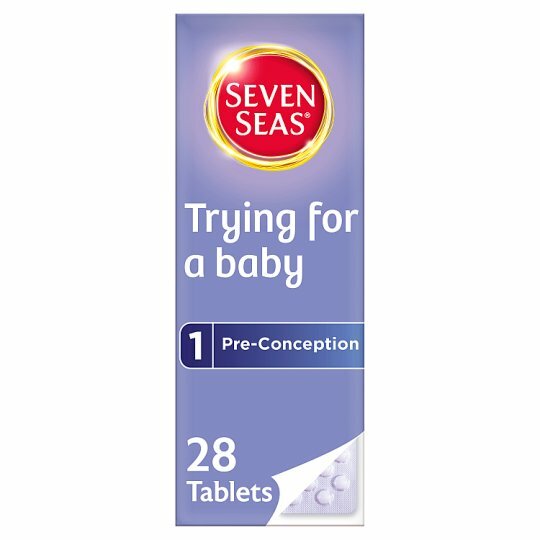 Seven Seas Trying for a Baby contains 400µg of Folic Acid which contributes to maternal tissue growth in pregnancy. The Department of Health recommends that women should take a daily supplement of 400µg of folic acid while they are trying to conceive, and should continue taking this dose for the first 12 weeks or pregnancy, when the baby's spine is developing. It also contains essential vitamins and minerals expertly blended which work in harmony with your body, for you and your unborn baby. Dosage: Take one pill a day. Best taken with food. If you forget to take a pill, don't worry, simply miss a day. Do not exceed the recommended dosage. Food supplements are intended to supplement the diet and should not be regarded as a substitute for a varied diet and a healthy lifestyle. This product contains iron which, if taken in excess, may be harmful to young children - Keep out of sight and reach. KEEP OUT OF THE REACH OF YOUNG CHILDREN.